Easy Keto Chia Pudding, 3 Suuuper Tasty Variations! You are here: Home / Low Carb / Easy Keto Chia Pudding, 3 Suuuper Tasty Variations! Think of this keto chia pudding as a combination of low carb overnight oats and a creamy, sweet and delicious keto pudding — basically, a guilt free dessert you can enjoy for low carb breakfasts and snacks! Not only is this 3 ingredient recipe low in net carbs, it’s full of nutrients, fiber, and healthy fats, and comes together in under 5 minutes with a simple twirl of the wrist. Below I’ll share a bunch of keto chia pudding variations to try — all guaranteed to start your day right. So let’s do this! Chia seeds are one of the coolest low carb shopping list items. First off, they’re crazy high in Omega 3’s, fiber, and contain a decent amount of protein. But the coolest part about them is their ability to absorb liquids to form a gelatin on the surface. In fact, they can absorb 27 times their weight in liquid! Which is why they’re the perfect ingredient in keto chia pudding and low carb oatmeal (i.e. keto chia oatmeal). Chia seeds are high in carbs than most foods I use in my low carb recipes, however, the carbs in chia seeds are primarily fiber, which makes them low in net carbs. You can use whatever low carb milks you fancy in this keto chia pudding recipe. I usually use almond or coconut milk, whatever we have in the fridge. You can also use canned full fat coconut milk for a creamier, slightly sweet and higher fat option. *If using canned coconut milk, be sure to stir the contents of the can together, as the cream and milk will separate over time. You can also use double the milk for a keto chia drink — I’d recommend blending everything together before you give it a sip. I used my keto sweetener of choice, powdered erythritol, in this keto chia pudding. I love this ingredient as it looks, tastes, and has a similar mouth-feel to regular sugar. Using powdered vs granular allows this ingredient to fully dissolve into the keto chia pudding. Stir the ingredients together, then stir them again. 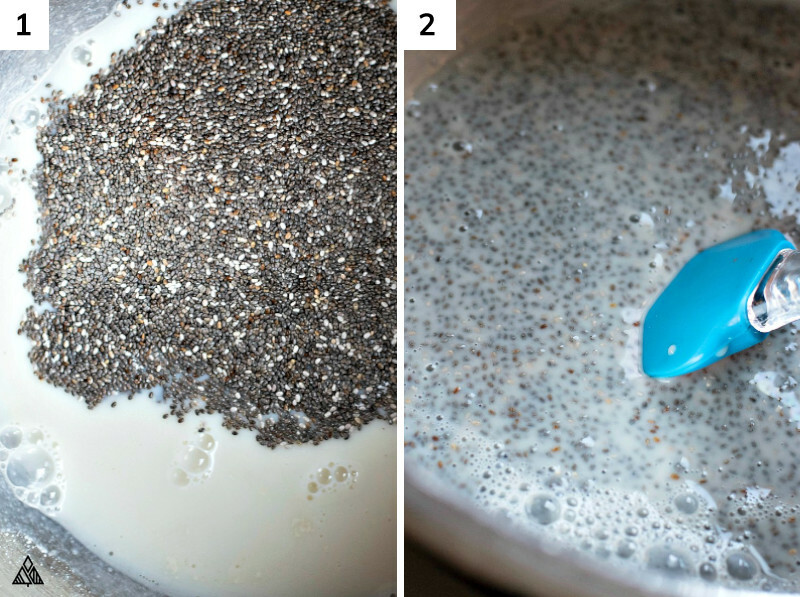 Chia seeds start to form a gel around the surface as soon as they come in contact with liquids — which is why it’s important to break up any clumps that form after the first 5 minutes. This will ensure all the chia seeds can fully expand, and our keto chia pudding is clump-free. Allow the keto chia pudding to expand. Throw these low carb foods together the night before. This gives our chia seeds enough time to fully expand in the fridge. If you’re realllllly craving keto chia pudding, this can be made 3 hours in advance. The best part about this keto chia pudding recipe is how creative you can get with a handful of mix-ins and toppings — so many options in fact, you can enjoy a different type of keto chia pudding everyday of the week! Low carb fruits — Either sliced or mashed into a “compote”. Berries are usually your best bet, I love strawberries blueberries blackberries and raspberries. Chopped low carb nuts — pecans, almonds, walnuts, yummmm! Low carb Greek yogurt — adds some protein to low carb breakfast ideas! Keto sweetener of choice — I use erythritol, liquid stevia would be great as well. Matcha powder — green tea in powdered form. Low carb protein powder — skip sweetener if adding this ingredients (the best tasting protein powders are typically sweetened). 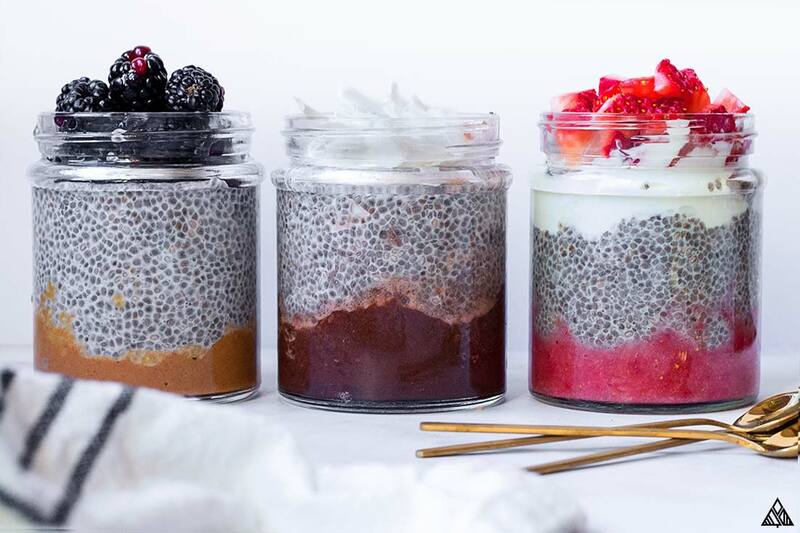 In the recipe below, I’ll share three of my favorite low carb chia pudding variations. An important variation to mention is “smooth” keto chia pudding vs. “crunchy”. Here’s the deal, not everyone likes the crunchy factor of keto chia pudding! To remedy that, you can simply place the ingredients in a blender, and blend until smooth. This can be done with any of the variations listed below. 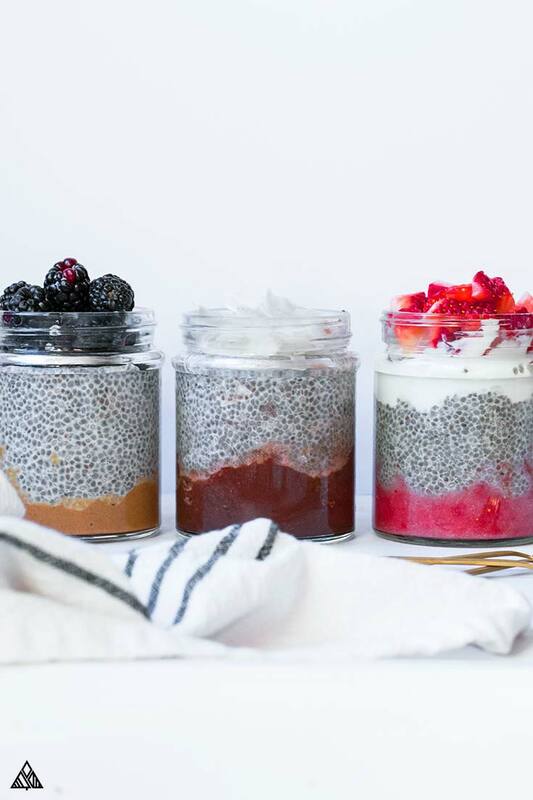 Store your chia pudding keto in the fridge for low carb snacks and breakfasts on the go! 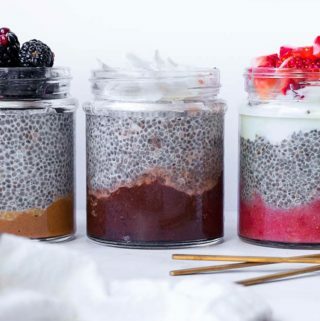 Add toppings when you divvy the keto chia pudding into containers, or wait until you’re ready to eat. 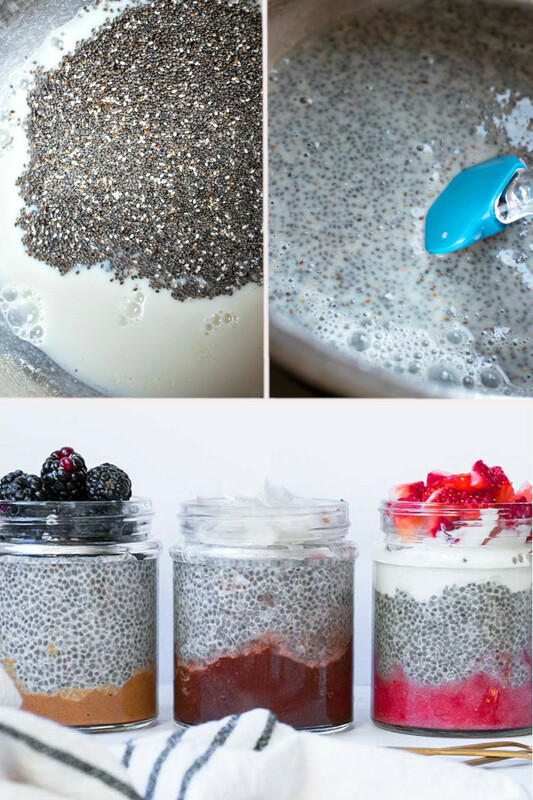 At the beginning of the week, I like to prepare 4 servings of paleo chia pudding into my best meal prep containers (usually a mason jar), and add the mix-ins / toppings at the same time. This way, I don’t have to flood my sleepy brain with low carb breakfast ideas! When using this recipe for low carb meal prep, leave out any ingredients you expect to add a “crunch” to the low carb pudding — think nuts or shredded coconut. Add these in right before you serve. Hope you all love this keto chia pudding recipe! Let me know your thoughts in the comments below — which variations did you try? Which was your favorite? 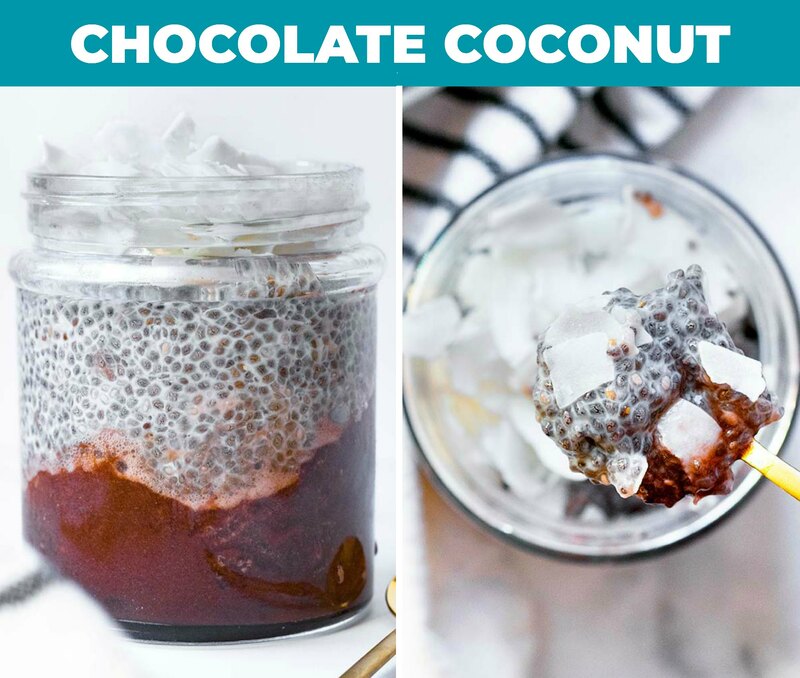 Here are 3 suuuper tasty low carb and keto chia pudding recipes for breakfast, snacks and desserts! 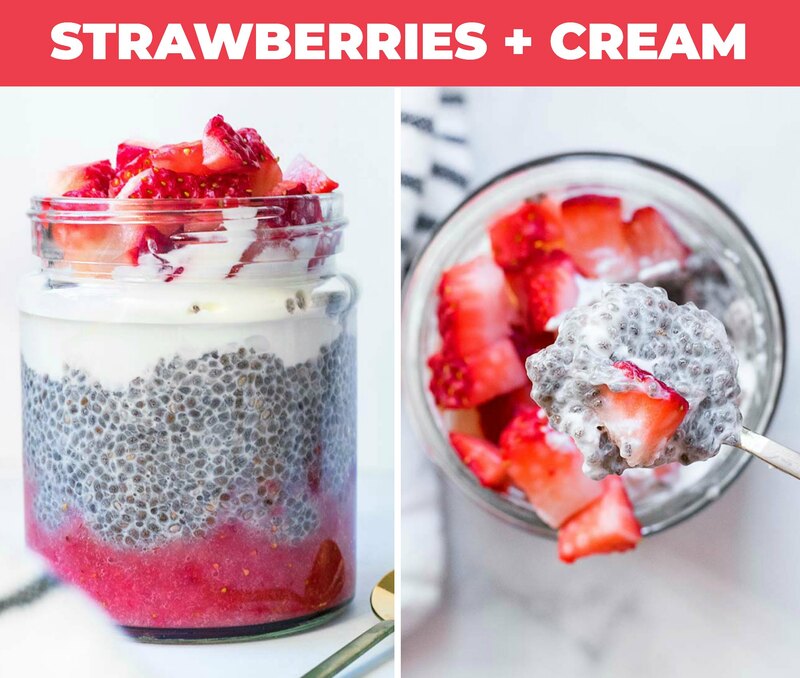 Made from almond milk, chia seeds, and a handful of tasty add ons! Add all ingredients for the “base” to a large bowl, and stir to combine. Allow the ingredients to settle for 5 minutes, then mix everything again to smooth out any clumps. Cover and place pudding in the fridge overnight (or for at least 3 hours). Stir in any of the variations you’re craving and enjoy! 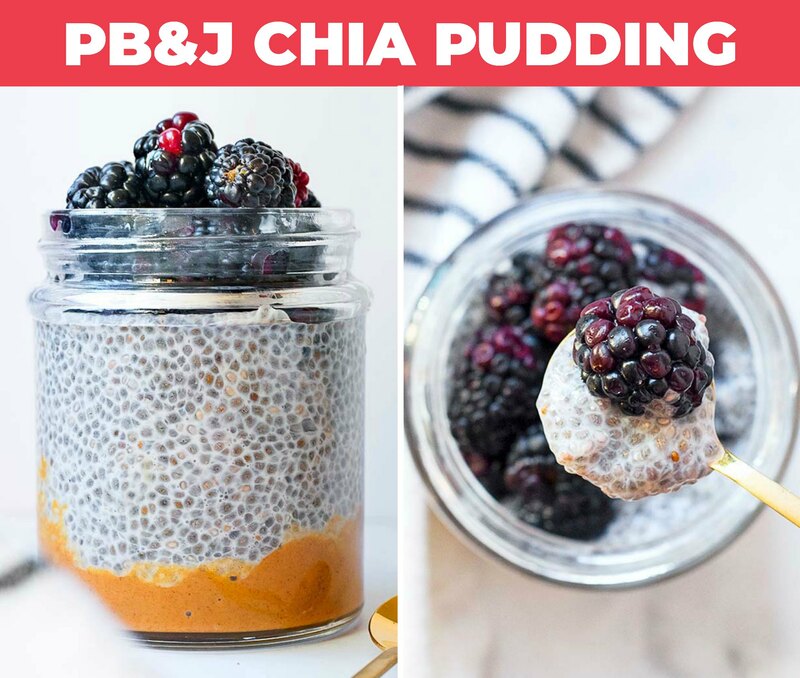 * If you’d prefer creamy chia pudding, place your ingredients in a blender after the chia seeds have expanded and blend until smooth. The nutritional information below is based on 1 serving, or ½ cup of chia pudding. It’s for the “base” recipe (any of the variations below will increase the carb count).